Not to be confused with Pride parade. On Saturday, June 27, 1970, Chicago Gay Liberation organized a march[full citation needed] from Washington Square Park ("Bughouse Square") to the Water Tower at the intersection of Michigan and Chicago avenues, which was the route originally planned, and then many of the participants extemporaneously marched on to the Civic Center (now Richard J. Daley) Plaza. The date was chosen because the Stonewall events began on the last Saturday of June and because organizers wanted to reach the maximum number of Michigan Avenue shoppers. Subsequent Chicago parades have been held on the last Sunday of June, coinciding with the date of many similar parades elsewhere. Subsequently during the same weekend, gay activist groups on the West Coast of the United States held a march in Los Angeles and a march and "Gay-in" in San Francisco. 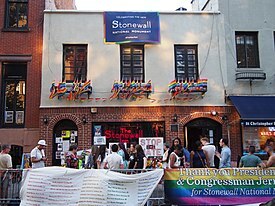 In the 1980s there was a major cultural shift in the Stonewall Riot commemorations. The previous loosely organized, grassroots marches and parades were taken over by more organized and less radical elements of the gay community. 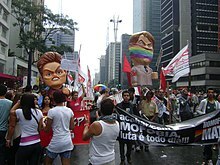 The marches began dropping "Liberation" and "Freedom" from their names under pressure from more conservative members of the community, replacing them with the philosophy of "Gay Pride" (in San Francisco, the name of the gay parade and celebration was not changed from Gay Freedom Day Parade to Gay Pride Day Parade until 1994). The Greek lambda symbol and the pink triangle, which had been revolutionary symbols of the Gay Liberation Movement, were tidied up and incorporated into the Gay Pride, or Pride, movement, providing some symbolic continuity with its more radical beginnings[clarification needed]. The pink triangle was also the inspiration for the homomonument in Amsterdam, commemorating all gay men and lesbians who have been subjected to persecution because of their homosexuality. ^ "History of the LGBT rainbow flag on its 37th anniversary". New York Daily News. 2015. Retrieved 25 November 2018. ^ Morgan, Thad (June 2, 2017). "How Did the Rainbow Flag Become an LGBT Symbol?". History Network. A&E Networks. Retrieved 25 November 2018. ^ Van Niekerken, Bill (June 22, 2018). "A history of gay rights in San Francisco". San Francisco Chronicle. Retrieved 25 November 2018. ^ "WATCH: Ellen Page Confronts Brazil's Biggest Homophobe on 'Gaycation'". 12 March 2016. Retrieved 10 June 2018. This page was last edited on 16 March 2019, at 15:40 (UTC).